How is Wastewater for Reuse Treated? In order to protect public health and environmental quality, the NJDEP requires extensive treatment and disinfection of wastewater effluent prior to reuse. 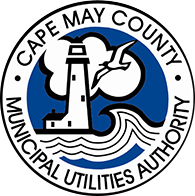 The Cape May County Municipal Utilities Authority utilizes a highly engineered system that includes filtration, biological and chemical processes plus chlorination and ultraviolet disinfection to achieve the highest “Public Access” standards established by the NJDEP. The CMCMUA closely monitors this advanced treatment process to ensure that all regulatory requirements are being met. Where is Wastewater Reused in Cape May County? Cape May County Municipal Utilities Authority’s Seven Mile Beach/Middle Region Wastewater Treatment Plant and Sludge Composting Facility - Up to 50,000 gallons per day for wash down of equipment and odor control systems, landscape irrigation, street sweeping, and sewer jetting. County of Cape May - Up to 169,000 gallons per day for landscape irrigation at the Crest Haven Complex (including the Administration Buildings, Nursing Home and Rehabilitation Center, Health Department Building, Technical High School, Special Services School, Veteran’s Cemetery, and various athletic fields), cage and run wash down at the County Animal Shelter and Adoption Center, and landscape irrigation, cage and pen wash down, and toilet flushing water at the County Park and Zoo. Township of Middle Davies Sports Complex - Up to 81,000 gallons per day for landscape irrigation at the recreational fields. Cape May County Campus of Atlantic Cape Community College - Up to 10,000 gallons per day for landscape irrigation. Pipes and hydrants carrying reclaimed water are color-coded with purple to differentiate them from potable water supplies. The reclaimed water system is kept separate from drinking water supplies. Last Modified May 11, 2017, 4:10 p.m.